A government shutdown is when non-essential discretionary federal programs close. It occurs when Congress fails to appropriate funds. In the normal budget process, Congress appropriates funds by September 30 for the following fiscal year. When that doesn't happen, it enacts a continuing funding resolution. If Congress can't even agree on that, it forces a shutdown. That signals a complete breakdown in the budget process. On January 25, 2019, President Donald Trump and Congressional leaders agreed to end the most recent shutdown. Trump signed a bill that funded the government for three weeks while a bipartisan committee negotiated plans for increased border security. On February 12, 2019, the committee approved a budget package that included $1.375 billion for 55 miles of new border fences. It adds $1.7 billion to Homeland Security's budget for additional border security. On February 14, 2019, the Senate and House passed the measure, avoiding another government shutdown. Trump declared a national emergency in addition to signing the spending bill. The National Emergencies Act of 1976 grants the president broad discretion in declaring an emergency. President Barack Obama used it after the 2009 swine flu outbreak, and President George W. Bush used it after the 9/11 terrorist attacks. Trump plans to use the emergency to repurpose existing military spending to build the wall. He may also repurpose funds from the Army Core of Engineers designated for disaster relief. But he faces opposition from many fronts. Texas landowners are suing to protect their property rights. California has sued to keep the funds for wildfire disaster relief. Fifteen other states have also sued to keep Trump from bypassing Congress. On February 26, 2019, the House passed a joint resolution to repeal the national emergency. The Constitution states that only Congress has control over the budget. Democrats have the four Republican votes in the Senate needed to pass the bill. Any bill approved by both houses of Congress becomes law after 10 days if the president doesn't sign it. Trump has said he will veto it. The bill needs a two-thirds majority vote in both houses to override the veto. Trump launched the shutdown on January 4, 2019, when he said he wouldn't approve a budget that didn't provide $5.7 billion for a wall on the border with Mexico. It's a key piece of Trump's immigration policy. He believes it's the only solution to the growing number of migrants who have applied for asylum at the border since November 2018. 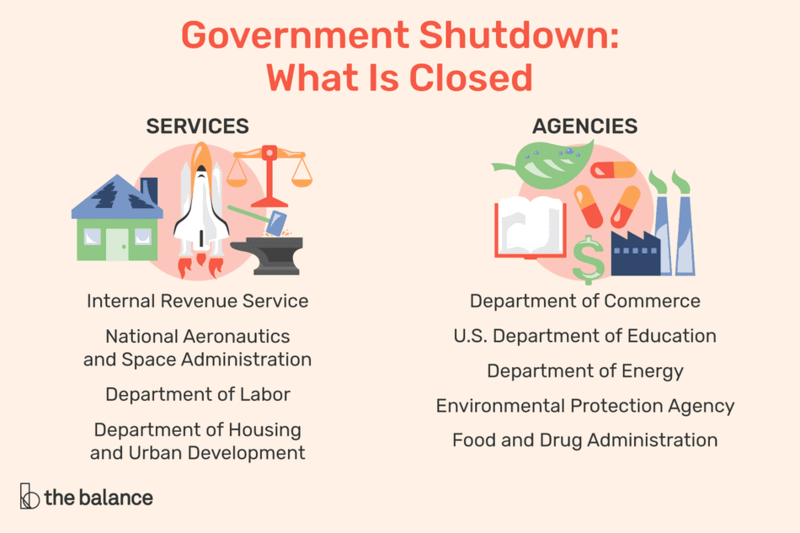 The most recent shutdown began on December 21, 2018, when the president and Congress couldn't agree on a budget for nine federal agencies. It became the longest shutdown in U.S. history on January 12, 2019, when it surpassed 22 days. It ended January 25, 2019, at 35 days, when President Trump and Congressional leaders agreed to a stop-gap spending bill. There were 420,000 critical employees who kept working without pay. About 380,000 non-critical employees were sent home without pay. As the shutdown stretched on, many looked for part-time work to pay bills. On January 11, Congress passed a bill to reimburse federal exempt employees for lost wages once the shutdown ended. Contract workers won't be reimbursed. Agriculture - 40 percent of 95,383 workers. Farmers can't get loans processed. March food stamps could be cut. Homeland Security - 13 percent of 232,860 workers. Companies can't verify a worker's immigration status. Housing and Urban Development - 95 percent of 7,497 workers. Rental assistance for the elderly and disabled is delayed. Interior - 78 percent of 68,469 workers. National Park staffing wasn't sufficient to maintain and protect the parks, which remained opened. Vandalism destroyed natural resources that could take 300 years to replace. The department lost $400,000 a day in fees. The Environmental Protection Agency furloughed 95 percent of 13,872 workers. Justice - 17 percent of 114,154 workers. Federal civil cases and immigration court cases are delayed. Federal District Courts may stop hearing civil cases beginning January 25. State - 42 percent of U.S. workers and 26 percent of U.S. employees posted abroad. Treasury - 83 percent of 87,267 workers. Workers are being called back so refunds aren't delayed. Transportation - 34 percent of 54,230 workers. Some security screeners have called in sick. This created delays in some airports. In addition, many smaller agencies and administrations were shut down. For example, 95 percent of NASA employees were furloughed. As a result, it took more than a week to repair the Hubble Space Telescope. After the first two weeks, the shutdown affected economic growth. The Congressional Budget Office said the shutdown reduced gross domestic product by $11 billion. That breaks down into $3 billion in the fourth quarter of 2018 and $8 billion in January 2019. When government spending resumed, all would be recovered but $3 billion. On August 23, 2018, the U.S. Senate approved an $850 billion spending bill for Fiscal Year 2019 that funded the departments of Defense, Labor, Education, and Health and Human Services. On September 18, it passed a short-term spending bill that funded the other departments until December 7. It included $1.6 billion for the border wall. Congress then extended funding until December 21. On December 11, 2018, Congressional Democrats met with the president. Trump threatened to shut down the government if they didn't include $5 billion to build the wall. Democrats said a wall would be ineffective. They offered $1.3 billion to continue current border-security funding. It includes border fencing, levee walls, and technology but not a steel barrier wall. They want more funds to target ports of entry, advanced technology for scanning vehicles for drugs, and more immigration judges. On December 18, Trump said he would compromise. On December 19, 2018, the Senate approved an extension of current spending until February 8, 2019. But then Trump changed course, saying he wouldn't sign it. On December 20, 2018, the House of Representatives passed a bill that included funding to maintain existing barriers. Senate leaders tried to renegotiate and pass a new spending bill. At 7 p.m. eastern time it became clear that was not going to happen, and the government shut down. The U.S. border with Mexico is 2,000 miles long. A third of it already has a wall or fence. Much of that was built thanks to the Secure Fence Act of 2006. It cost $2.3 billion to expand barriers and checkpoints. It reduced immigration by 83,000. The reduced competition increased low-skilled workers' pay by $0.36 a year. The conservative Heritage Foundation says the money would be better spent on technology and agents to prevent illegal crossings. It advocates more enforcement to apprehend immigrants who overstay their visas. Democrats wanted the bill to protect immigrants eligible for Deferred Action for Childhood Arrivals. They were concerned that Trump's immigration plan would end the program in February. Some Republicans also voted against the bill. They wanted to focus on passing the permanent budget instead of another continuing resolution. On January 22, Congress ended the shutdown. It passed a continuing resolution that expired at midnight on February 8, 2018. Republicans promised to work with Democrats on DACA legislation. On February 9, the government shut down again, this time for five and a half hours. Senator Rand Paul objected to the bipartisan two-year spending bill. It added more than $300 billion to the debt. The bill exceeded the spending caps imposed by sequestration. Republicans increased defense spending by $80 billion a year to $629 billion. Sequestration limited it to $549 billion. Democrats added $60 billion a year for nondefense discretionary spending. That's above the sequestration limit of $516 billion. The bill included $80 billion in disaster relief and $6 billion to treat opioid addiction. It also included $7 billion to fund community health centers for two years. Tax provisions added $17 billion. The discretionary budget funds most federal departments. But those that provide essential services are not shut down. Essential services are those that include defense, national safety, and security. Many of these agencies are set up so they can operate for weeks without a funding bill. The Defense Department warned it wouldn't pay military personnel during a shutdown. Internal Revenue Service, except those processing tax returns. 2017. The government avoided a shutdown on April 28, 2017. That's when the continuing resolution, passed on September 30, 2016, expired. Congress hadn't allocated funds for the FY 2017 budget, which covered October 1, 2016, to September 30, 2017. The continuing resolution funded the government during the 2016 presidential election and transition. The Senate and House approved the spending bill on May 1, 2017. It appropriated $1.1 trillion in spending. In March 2017, the Trump administration submitted a request to add $14.6 billion to the FY 2017 budget. It wanted to expand the defense budget by $24.9 billion, Homeland Security by $3 billion, and the Emergency budget by $5.1 billion. Trump asked Congress to cut $10 billion from all other departments. Included in that budget was $1.6 billion for a border wall with Mexico. On August 23, 2017, Trump promised his administration would shut down the government if Congress didn't include funding for the wall. The Obama administration reported the shutdown slowed economic growth by 0.2 percent to 0.6 percent. It also cost 120,000 jobs. The government was unable to issue certificates for ships carrying U.S. exports and 200 drilling permits were delayed. Around 850,000 federal employees were furloughed each day. 2011. In April, the Republican-led House and President Obama agreed to $80 billion in spending cuts from the Fiscal Year 2011 budget, averting a shutdown. Most of the cuts were programs that couldn't spend the funds and would have occurred anyway. In reality, only $38 billion was actually cut. 1995. The government shut down twice: November 13 to November 19, 1995, and December 5, 1995, to January 6, 1996. Republican Speaker of the House Newt Gingrich won the Republican Party's 1994 Contract with America. It promised to slash funding and introduce a balanced budget amendment to the Constitution.